Originally written in September 2015. We’ve lived in Asheville, North Carolina for the better part of a year now. As digital nomads on a budget, we Two Drifters work hard to stay within our financial means, so finding cheap eats in Asheville was key. WE LOVE FOOD, and are always on the search for delicious eateries that won’t break the bank. We go out to eat now and again (particularly to coffee shops because we have a caffeine addiction habit) but don’t often go to 5 star restaurants. Wherever we are, though, we have to try the local spots. It’s the ultimate intersection of food and travel. Fortunately, Asheville is full of tons of amazing places to eat and many of them are incredibly affordable. In some cases you could even swing a meal for under $5, or at least a delicious snack. Here are some of our favorite spots to grab an awesome and cheap breakfast, lunch, or dinner in the AVL. An unassuming exterior hides mouth-watering BBQ. Literally, the best I’ve ever tasted. 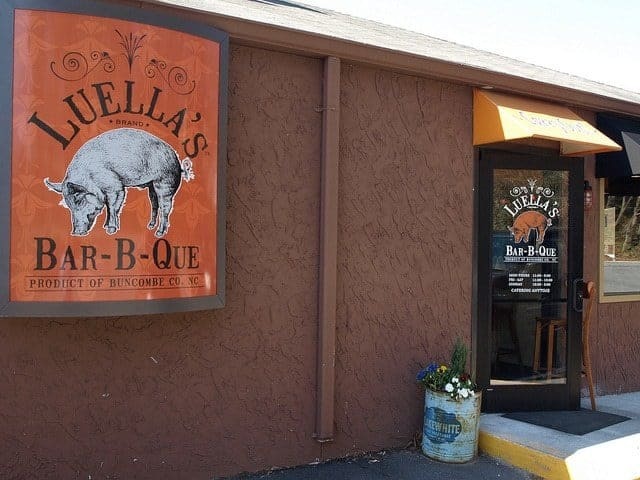 Luella’s BBQ is by far our favorite restaurant in all of Asheville, and the affordable prices are just the icing on the cake. 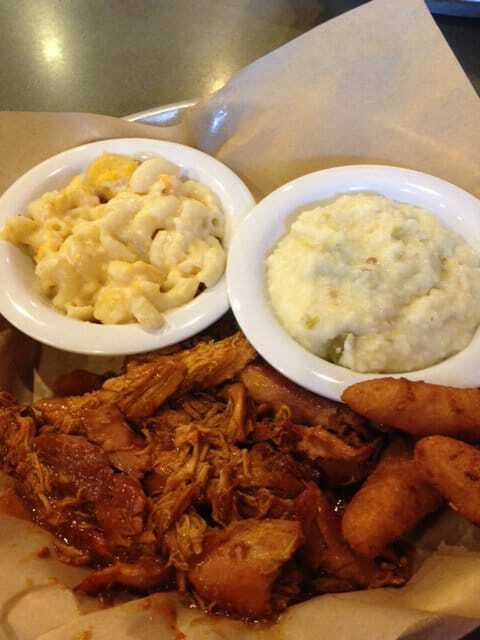 Around $10 gets you a generous helping of delicious meat, hush puppies, and two sides of your choice. I always choose the chicken, macaroni and cheese (my favorite food, because I am a grown up), and the grits. It results in a very monochrome-hued meal, but holy CRAP, is it delicious. Other incredible side dishes include green beans, pineapple casserole, fried okra, potato salad, and more. Nathan usually gets the pulled pork or brisket, but I’ve converted him to a chicken lover as well. Luella’s makes him very happy. Luella’s is not only one of the best cheap eats Asheville has to offer, but we even had them cater our wedding. Needless to say, the guests were immensely satisfied. Soooo cheap. Soooo delicious. 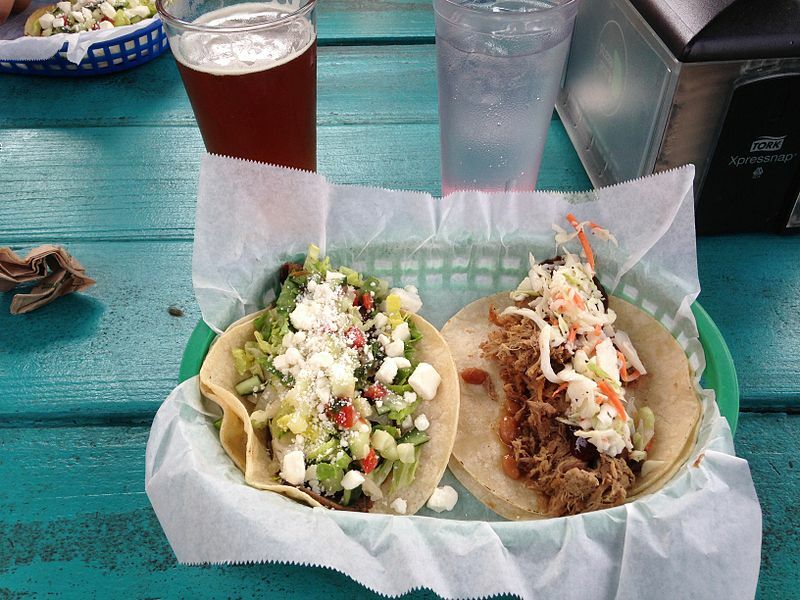 White Duck Taco Shop is one of our go-to choices for an inexpensive and quick lunch that doesn’t break the bank. White Duck has a setup where you order from the counter and then your food is brought to you at a table. This seems to be a popular way of dining in Asheville, but it’s great because it is fast and easy. At White Duck, you order off the chalkboard which boasts a dozen or so taco options. These seem to vary daily somewhat, but there are popular repeat flavors I’ve seen again and again including thai chicken, black bean, and pulled pork. No taco on the menu is more than a few dollars. You can grab two plus a $2 Tecate beer for an awesome lunch around $10. White Duck has two locations: one in downtown Asheville and one in the trendy River Arts District, which offers some lovely outdoor seating. A must-eat place on any trip to Asheville. Check out our friend Paige’s list of top 10 things to do in Asheville for more great ideas for your visit! We used to be big Cracker Barrel breakfast fans. No offense, Cracker Barrel, but you don’t hold a candle to the incredible homemade goodness that is Biscuit Head. Biscuit Head is just a southern breakfast dream. 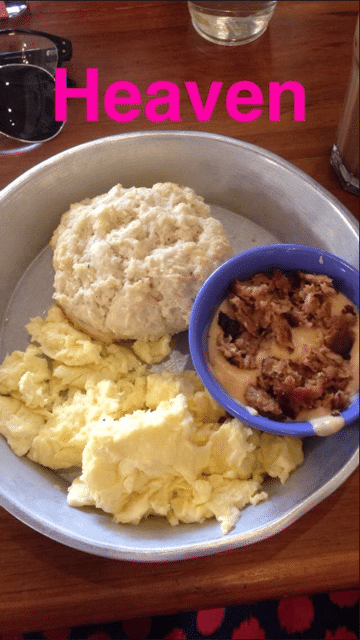 If you like biscuits, eggs, gravy, or some combination of these items, you’ll fall head over heels with this place. Words can’t even describe. In the above photo, I ordered my usual: the “half breakfast” that comes with a fluffy biscuit, 2 eggs cooked to order, and a side of your choice. The side I opted for was the incomparable sausage gravy. (There are also nearly a dozen unique gravy flavors., by the way). Oh gosh, just writing this I’m tempted to drag Nathan out to Biscuit Head this very minute. And the prices here are fantastic. That meal pictured? A whopping $6. Again, this is a place where you can eat like a king for under 10 bucks, easy. Biscuit Head’s mouthwatering menu also includes options like The Cajun Benedict: An open-faced biscuit topped with creole mustard, local andouille, 2 poached eggs, hollandaise, roasted red peppers and scallions or the Mimosa Fried Chicken Biscuit with mimosa fried chicken, sweet potato butter, sriracha slaw, and a poached egg. Enjoy pint-sized mimosas for around $5. Such a steal. 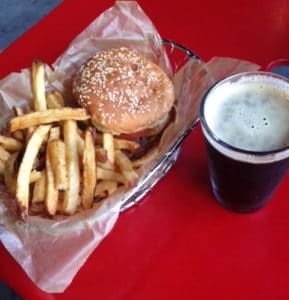 Farm Burger, located in a great location in downtown Asheville, may be a tad more pricey than the other restaurants mentioned. Farm Burger is known for, you guessed it, their burgers. Using only grass-fed beef, each burger is delicious and locally sourced. You can build your own from a plethora of ingredient options, or consider one of their creations. It’s definitely a taste of the south at Farm Burger. Clearly, it’s easy to gain weight in Asheville with all these delicious and affordable restaurants. Have you been to Asheville? What were your favorite ‘eats’, affordable or otherwise? 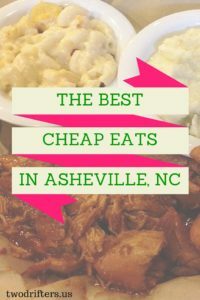 Let us know if we missed any of the top cheap eats in Asheville, and we’ll be sure to try them next time we’re back in the Blue Ridge Mountains. You guys hit the nail on the head. Our main goal at Farm Burger is to provide people with good, locally sourced food at an affordable price. 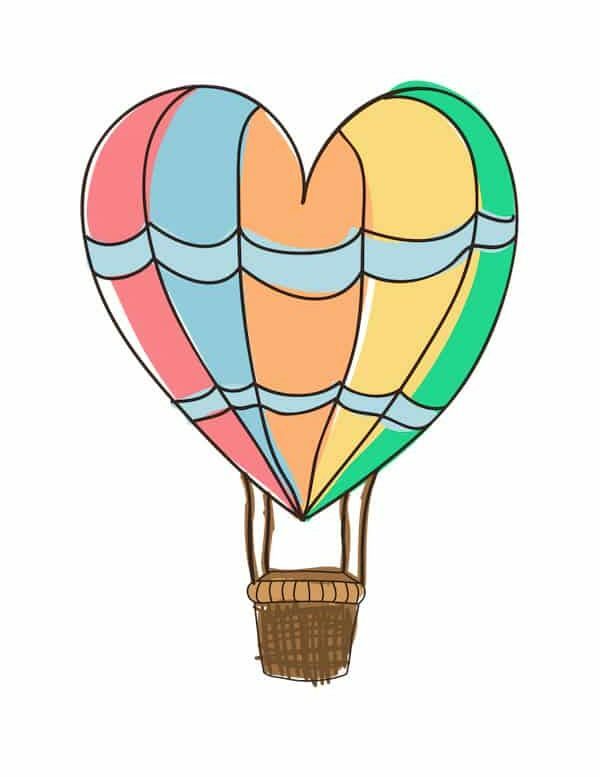 Great write-up guys – thank you!! I’ve been wanting to try more food in the Asheville, North Carolina area, and this gave me some ideas of affordable places to check out. Great list! Oh yay! I’m glad. We also just tried Thai Orchid this week. For lunch, you can get an amazing curry for only about 9 dollars and it was delicious!! Where is 12-bones on this list! It’s only the most amazing place to eat in Asheville! ahhh!! I have actually never been there! Luella’s stole my heart from the beginning. If 12 bones is the best, I simply must pay them a visit. We also want to try Buxton Hall BBQ (?) as we’ve heard that’s great as well! thanks for commenting Becky! We have yet to try the places you mentioned, but hope to soon. Asheville is SO FULL of great restaurants! Rosetta”s is great and cheap for vegetarian food. Rosetta’s is very good vegetarian fare, agree. And Mamacita’s is also a top choice when downtown. No White Duck Taco is not your traditional taco place, you got that right! I love the thai chicken taco. We lived for a year and a half in Asheville! So we def tried a lot of places 😉 We just love Luella’s…they even catered our wedding. Loved seeing White Duck Taco as the featured image! I’m exploring Asheville this week and we stopped there yesterday. Delicious! Will definitely have to try the others. You should try the Acropolis on Airport Rd. You will love their Greek salad and their pizza! Yaaaas! Luella’s BBQ is definitely one of my favorite! Asheville is such a cool town. It has a charm like no other smaller towns in the US. Love all the places you mentioned – but Rocky’s hot chicken shack is also one of my favs. $9 for a HUGE chicken pot pie plus lots of other great choices under $10. I’ve got to add one more to the list. I’ve been going here for 20+ years. They just re-opened after a few month hiatus to remodel the restaurant. You wouldn’t even recognize it from the old look! Luckily though – new look, but same great food and prices. It’s my absolute top pick of where I tell people to go in Asheville for a quality affordable meal. Actually, it’s where I tell people to go regardless of if budget’s an issue. It’s just my favorite restaurant in general. 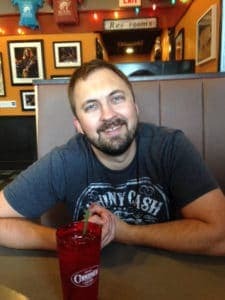 Cornerstone Restaurant – http://www.cornerstonerest.com/ – I have no affiliation other than I’m their #1 fan. Just picked up a chicken philly last night go to actually. The Barlas brothers own three restaurants in town: Cornerstone, Stoneridge Tavern, and Juicy Lucy’s and all three are top notch. By the way, I’m back in Asheville right now and will be around until Christmas. If you guys get back this way, give me a shout and let’s go eat at Cornerstone or go on a hike! One of the best things I’ve eaten lately is at White Duck Taco Shop–Pork belly taco with pickled watermelon rind–it had a unique, delicious flavor and texture. The lamb gyro taco is on point as well. oh we really miss White Duck!! Please have one of the Thai chicken tacos for me! Zia Tacqueria- in my opinion, as a vegetarian, way better veg offerings than White Duck. Their nopales tacos are amazing.